Ways I have decided to avoid the cookie clutch: do not sit in the staffroom for any of my breaks, instead head outside for a jaunt around the block followed by an egg muffin (see recipe here). Do not open the cookie jar to muse at what might be lurking inside. 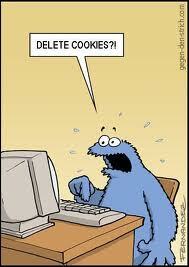 Do not be responsible for topping up the cookie jar. When purchasing cookies for said jar, only purchase cookies I don’t like. Cookies I don’t like are not fun biscuits. They are the biscuits you feed to your children before they have a birthday party they can remember and then ask for the fancier cookies. So, I have to buy fun cookies. It’s for the good of others. I shall sit back in the corner and watch thier waistlines increase as mine slowly, but surely, diminishes. Mwahahahaha! I am aiming for a cookie free week. Feel free to ask me on Friday how I did. I encourage it!! It might mean nothing to you, but it’ll mean the world to me. I have to be accountable to someone other than myself. That isn’t working so I’m seeking outside reprimand. The bed base – I won an online auction and will be spending a whopping $21 on a bed base to prop up our oh so “70s crack chic; lives on the floor” mattress. I think then, my paranoia of being bitten my invisible mites can come to a stop. I’m 99% sure I’m not crazy. Ok, 89%. Lacking a third beverage today, need to go and top up the other two: green tea with mandarin and lime flowers and aqua. Ta-taa! PS I jazzed up myyyy egg muffins with finely chopped mushrooms and brocolli and grated zucchini – sauteed in olive oil, salt and pepper. I also halved cherry tomatoes and popped them in on top after I poured the egg in. It went: veges, sausages (breakfast real pork soss), egg mix (FREE RANGE!!! ), tomatoes. Oven. Cook. Cool. Stash in containers to take to work. Eat extra one. Hehe. YUM!